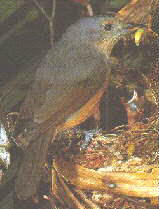 Bower’s Shrike-thrush is endemic to upland rainforests of the Wet Tropics region. It is one of four Australian shrike-thrushes, two of which occur in wet tropical rainforests. This one is the least known of the four. Shrike-thrushes are very closely related to whistlers, and may easily be mistaken for them. This Shrike-thrush is similar to the Little Shrike-thrush, but has a black bill, grey back and more darkly streaked throat and breast. The Little Shrike-thrush has a pinkish-brown bill. They are seen singly or in pairs. Females and males are clearly distinguishable as the female has an eye ring and eyebrow of pale feathers, unlike the male. More so than other shrike-thrushes, this bird is rather quiet in the rainforest. Its calls however are some of the most commonly mimicked by the Tooth-billed Bowerbird. These Birds usually feed on insects and their larvae from the mid canopy. Often this is in masses of vines in the undergrowth, on various tree trunks, and sometimes from the ground. This species is moderately common near Chambers Wildlife Rainforest Lodge , and at Lake Eacham. This is one of the more common plainer birds seen in the tropical rainforest. It has a pleasant call that contrasts with it's dull appearance. It is restricted to higher altitude rainforest in the wet tropics, but is common on the Atherton Tablelands.